Sun., June 26, 2016, 8:55 p.m.
RENTON, Wash. – The Seahawks haven’t exactly been daunted so far by life without Marshawn Lynch. “It’s different not having him,” offensive coordinator and play-caller Darrell Bevell said last week at the Seahawks’ final minicamp before they report for training camp July 29. It’s only been four months including organized team activities and minicamps – plus the retired Lynch riding camels in Egypt and taping espisodes of “Running Wild” in the woods with TV adventurer Bear Grylls – since Seattle’s star running back hung up his cleats on Twitter during the Super Bowl. Yet the Seahawks have already moved on past their franchise cornerstone for the previous five years. The offense no longer has a five-time Pro Bowl back and 2012 All-Pro, the league’s leading rusher from 2010 into the 2015 season. And the locker room no longer has “I’m just here so I won’t get fined,” the crotch-grabbing, Nestea plunges across the goal line on touchdown runs, the league fines for media relations and the “Beast Mode” persona that made Lynch as beloved outside the Seahawks building for being contrarian as he was inside it for being so darn good at his job. We’ll see starting in September if life is better for the Seahawks offense post-Lynch. “We have so many more pieces now,” Bevell said. Coach Pete Carroll said last week the team “absolutely” expects Thomas Rawls, Lynch’s replacement as featured back, to return from a broken ankle and torn ligaments suffered in December in time for the 2016’s opening game Sept. 11 against Miami. And coaches are vowing to run the ball just like Seattle did with No. 24. Seattle added four more running backs in May behind Rawls, who last season became the first undrafted free agent in NFL history to rush for 160 yards in multiple games of a rookie season. Three of the new backs are from the draft: C.J. Prosise, Alex Collins and Zac Brooks. The fourth is the intriguing Tre Madden, the undrafted free agent from USC who got long looks and specific praise from Carroll during minicamps. Prosise, Seattle’s third-round pick, had a hip-flexor injury slow him through his first weeks of minicamps and OTAs. But he was noticeable in his return to the field for the final minicamp last week. The former Notre Dame wide receiver looked smooth sprinting down the field and catching passes in stride with one hand. Training camp will continue his warmup to being the new, third-down back this fall, replacing the departed Fred Jackson. Carroll said the Seahawks have “a big plan” for Prosise. Fifth-round pick Collins impressed just about everyone who watched him in May into June. The word out of Arkansas on the 5-foot-10, 217-pound Collins, who was the third man in Southeastern Conference history to rush for 1,000 yards in three consecutive years (after Darren McFadden and Herschel Walker), that he was a plundering runner, Lynch style. But what caught the eye most about Collins in OTAs and minicamps – besides the braided hair dangling beneath his helmet across the top of his back – was how fluid he was catching the ball. Last week in the final minicamp practice he zoomed past Cassius Marsh, a candidate to replace departed Bruce Irvin as Seattle’s strongside linebacker, on a wheel route down the sideline and caught a long pass in stride from Russell Wilson. Collins sprinted with the ball into the end zone, then Wilson ran half the field to congratulate him. Wilson said the week before that, in an OTA practice closed to the media, Collins made a cut so sharp and exquisite in the open field, the quarterback called it one of the best moves he’d ever seen. Collins arrived in Seattle in May with the opportunity to get some specific, short-yardage roles as a rookie. He enters training camp as a prime threat to veteran Christine Michael for the job of Rawls’ primary backup at No. 2 on the depth chart. Brooks was a part-time back for Clemson, and it remains to be seen why the Seahawks drafted him in the seventh round. Madden seized early opportunities in May into June while Brooks was injured; at times Madden alternated with Michael for snaps with the first-team offense. He also showed a willingness and skill in pass blocking, albeit with no one yet in full pads. We all got see see last winter a glimpse of a Seahawks’ life without Lynch, as the 2015 season was only first injury-filled one of his nine-year career. And Seattle liked the looks of that life. In the nine regular-season games and one in the postseason Seattle played without him, Rawls convinced the team he was ready to replace Lynch. Indeed, had Rawls not broken his ankle in early during a win at Baltimore, Lynch may not have played another snap in the NFL. 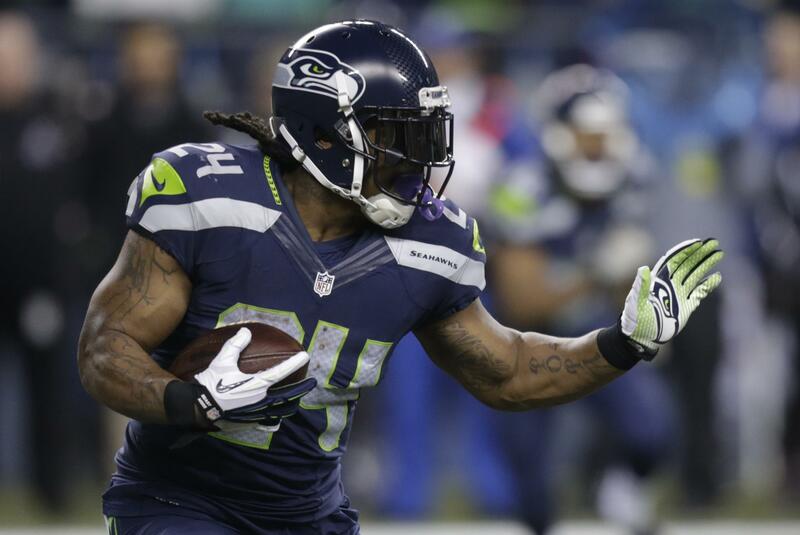 Lynch returned from his sports-hernia-like surgery and California rehabilitation for the team’s loss at Carolina in January’s NFC divisional playoffs. From November through then, the Seahawks offense took off – mostly by relying more on Wilson’s throwing and improvisation. The offensive line improved at least incrementally from allowing 31 sacks in the first seven games, and Wilson became the first Seattle quarterback to throw for 4,000 yards in a regular season. Doug Baldwin shared the NFL lead with a franchise-record 14 touchdown catches. Tyler Lockett was so fast and talented down the field, and everywhere as a rookie wide receiver and Pro Bowl kick returner, he is now poised for multiples roles all across the offense in 2016. The Seahawks went from ninth in the NFL in total offense and 10th in points per game with Lynch in 2014 to fourth in each category last season mostly without him. And that’s not to mention what they still expect to get from Jimmy Graham, the $40 million tight end Seattle acquired before last season from New Orleans. He is coming back from season-ending knee surgery from late November. Carroll said Graham also “absolutely” should be ready for September’s opener. So while no Seahawk wants to – or would dare – say life is better without Lynch, is certainly is more varied. With the potential to be more dynamic. “He’s such a great player, but toward the end of the year last year we didn’t have him, as well,” Bevell said. Published: June 26, 2016, 8:55 p.m.